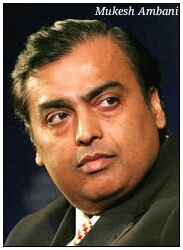 Musings 'n scribblings of a philanthrope .. : Mukesh Ambani shares entrepreneurial lessons ..
Mukesh Ambani is India's richest industrialist, though Reliance family is second to Tata Sons as the largest business conglomerate in India. Frankly speaking, I used to think of him as a person who inherited a great business empire from his father. Despite academic qualification from one of the best business schools of the world, I really had doubts whether he would succeed. But the recent launch of Jio telecom which made India the most competitive telecom field in the world was something which would make everyone stand and applaud. Putting up to $33 billion into the telecom sector in the new startup, he not only made Jio the most promising telecom player in India, he made India the most competitive telecom field in the world. Even Vodafone had to call quits, were it not for Birla's Idea Telecom's timely intervention. Recently while talking to a crowd of well-wishers, fellow industrialists and media persons at a NASSCOM event, he shared his life lessons on entrepreneurship. Though these lessons are simple, they are heavy weight, worth their weight in gold... Since it comes from one of India's greatest entrepreneurs, it has great value for youngsters and old alike. Click here for the youtube video of the talk.. Here are his life lessons, hope someone out there benefits from it. 1. Figure out what one wants to do in life, what dream to pursue ..
3. In whatever actions or dreams one pursues, create societal value which benefits the society first, later financial returns will follow ..
4. Realise that failures are just a step before success, learn from them and never give up. The next two points he says are non-negotiable ..
Now my respect for this person has increased by many times. As he says, creating societal value is one thing entrepreneurs should be primarily concerned about. When Mukesh visited IIT Bombay during the late 90s, though I attended hsi talks, I never then was impressed by his capabilities and personality. Now I am thoroughly impressed with this person and his abilities to influence society and work wonders. I still have some anguish at the way he handles national wealth of oil in the Krishna Godavari basin for his personal aggrandisement.